***GUIDE PRICE £550,000 - £600,000*** Robert Luff & Co are delighted to present this unique and deceptively spacious, detached home, conveniently located on Brighton Road - a stones' throw from the beach and a few hundred yards from Beach Green and the popular "Perch" cafe/restaurant. Lancing village centre along with the mainline railway station are within easy walking distance and the 700 bus service passes along Brighton Road, providing easy access to Brighton, Worthing and beyond. The property is configured as TWO SEPARATE DWELLINGS and, as such, would be ideal for multi-generational living or home and income/Airbnb. The upper part of the property is arranged as a chalet bungalow and consists of: Ground floor entrance hall, living room, contemporary fitted kitchen/dining room, conservatory leading to a balcony, two double bedrooms, family bathroom and first floor master bedroom with superb sea views. The lower part of the property is arranged as a garden flat and comprises: Hallway, living room, dining room, fitted kitchen, utility room, two double bedrooms and bathroom. Outside, there is a South facing rear garden. VIEWING ESSENTIAL!! Double glazed windows to rear and side. High quality, contemporary "Wren" kitchen comprising of: Range of fitted white high gloss wall and base level units, fitted sparkle effect work surfaces incorporating sink unit, integrated electric oven, gas hob, extractor hood and dishwasher, breakfast bar, space for dining table, wall mounted combination boiler, radiator. Double glazed windows to rear and side with sea glimpses, double glazed doors to balcony. South facing with coastal views. 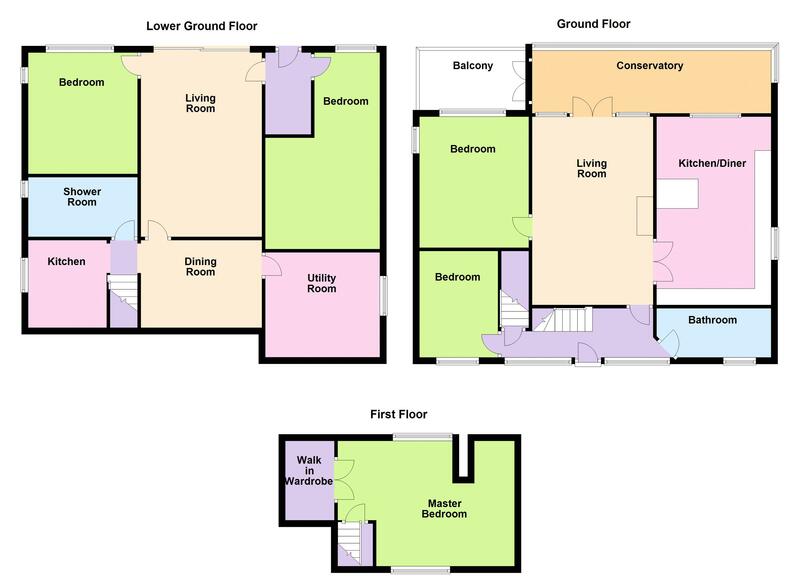 Fitted white suite comprising: panel enclosed bath with mixer tap and shower over, vanity wash hand basin, low flush WC, radiator, double glazed window to front. Double glazed window to downs and Lancing College, double glazed window to rear with sea and coastal views, walk-in wardrobe, radiator. Double glazed door from garden, laminate flooring, coving. Patio door to garden, wall lights, television aerial point, radiator. Double glazed window to side, range of fitted wall and base level units, fitted roll edged work surfaces incorporating stainless steel single drainer sink unit with mixer tap, electric oven, gas hob, extractor hood. Double glazed window to side, space and plumbing for washing machine, wall mounted combination boiler. Double glazed windows to rear, coving, wall lights, radiator. Patio, lawn, flower-beds, fence enclosed, side access.